Originally published under the title, "Sisi's Brave New Egypt?" First there was his historic speech where he, leader of the largest Arab nation, and a Muslim, accused Islamic thinking of being the scourge of humanity—in words that no Western leader would dare utter. This remarkable speech—which some say should earn him the Nobel Peace Prize—might have fallen by the wayside had it not been posted on my website and further disseminated by PJ Media's Roger L. Simon, Michael Ledeen, Roger Kimball, and many others, including Bruce Thornton and Robert Spencer. Instead, mainstream media headlines on the day of and days after Sisi's speech included "Egypt President Sisi urged to free al-Jazeera reporter" (BBC, Jan 1), "Egyptian gays living in fear under Sisi regime" (USA Today, Jan. 2), and "George Clooney's wife Amal risks arrest in Egypt" (Fox News, Jan. 3). In other words, jihadi terror is a product of Sisi, whom the NYT habitually portrays as an oppressive autocrat—especially for his attempts to try to de-radicalize Muslim sermons and teachings (as discussed in this article). Next, Sisi went to the St. Mark Coptic Cathedral during Christmas Eve Mass to offer Egypt's Christian minority his congratulations and well wishing. Here again he made history as the first Egyptian president to enter a church during Christmas mass—a thing vehemently criticized by the nation's Islamists, including the Salafi party (Islamic law bans well wishing to non-Muslims on their religious celebrations, which is why earlier presidents—Nasser, Sadat, Mubarak, and of course Morsi—never attended Christmas mass). Egypt has brought a humanistic and civilizing message to the world for millennia and we're here today to confirm that we are capable of doing so again. Yes, a humanistic and civilizing message should once more emanate from Egypt. This is why we mustn't call ourselves anything other than "Egyptians." This is what we must be—Egyptians, just Egyptians, Egyptians indeed! I just want to tell you that Allah willing, Allah willing, we shall build our nation together, accommodate each other, make room for each other, and we shall like each other—love each other, love each other in earnest, so that people may see… So let me tell you once again, Happy New Year, Happy New Year to you all, Happy New Year to all Egyptians! Sisi stood side-by-side with Coptic Christian Pope Tawadros II—perhaps in remembrance of the fact that, when General Sisi first overthrew President Morsi and the Muslim Brotherhood, Pope Tawadros stood side-by-side with him—and paid a heavy price: the Brotherhood and its sympathizers unleashed a Kristallnacht of "reprisals" that saw 82 Christian churches in Egypt attacked, many destroyed. 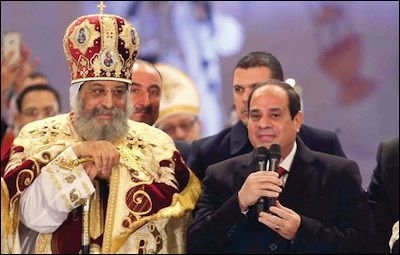 It is also significant to recall where Sisi came to offer his well-wishing to the Christians: the St. Mark Cathedral—Coptic Christianity's most sacred church which, under Muhammad Morsi was, for the first time in its history, savagely attacked, by both Islamists and the nation's security (see pictures here). There is, of course, a reason the mainstream media, which apparently follows the Obama administration's lead, has been unkind to Sisi. One will recall that, although Sisi led the largest revolution in world history—a revolution that saw tens of millions take to the streets and ubiquitous signs and banners calling on U.S. President Obama and U.S. ambassador to Egypt Anne Patterson to stop supporting terrorism (i.e., the Brotherhood)—U.S. leadership, followed by media, spoke only of a "military coup" against a "democratically elected president," without pointing out that this president was pushing a draconian, Islamist agenda on millions who rejected it. So what is the significance of all this—of Sisi? First, on the surface, all of this is positive. That Sisi would criticize the Muslim world and Islamic texts and thinking—in ways his Western counterparts could never—and then continue his "controversial" behavior by entering the Coptic Christian cathedral during Christmas mass to offer his greetings to Christians—a big no-no for Muslim leaders—is unprecedented. Nor can all this be merely for show. 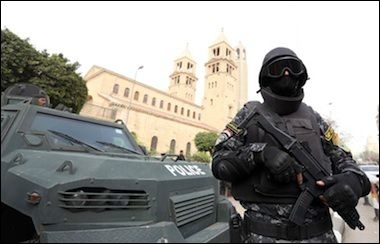 In the last attack on a Coptic church, it was two Muslim police officers guarding the church who died—not the Christian worshippers inside—a rarity. That Sisi remains popular in Egypt also suggests that a large percentage of Egyptians approve of his behavior. Recently, for instance, after the Paris attacks, Amru Adib, host of Cairo Today, made some extremely critical comments concerning fellow Muslims/Egyptians, including by asking them "Are you, as Muslims, content with the fact that today we are all seen as terrorists by the world?… We [Egyptians] used to bring civilization to the world, today what? — We are barbarians! Barbarians I tell you!" That said, the others are still there—the Muslim Brotherhood, the Salafis, those whom we call "Islamists," and their many sympathizers and allies. Worst of all, they have that "corpus of [Islamic] texts and ideas" that has been "sacralized over the centuries" (to use Sisi's own words) to support them—texts and ideas that denounce Sisi as an "apostate" deserving of death, and thus promising a continued struggle for the soul of Egypt.